Continuation from the previous 120 parts, the whole series can be found at http://www.nikoport.com/columnstore/. Yesterday, Kevin Farlee (Program Manager for Columnstore Indexes) announced that Columnstore Indexes have finally found their way into Standard Tier of the Azure SQL Database, I decided not to delay the research and dive straight into available solution. After the official announcement that COlumnstore Indexes became part of All (Web,Standard,Express & even Local) editions for SQL Server in November of 2016, it was only a question of time when Microsoft Data Platform leadership would find resources & time to make something similar on their prime cloud offer – the Azure SQL Database and without any doubt, I am incredibly grateful to the effort that Kevin Farlee lead. For the start I decided to create the recommended and supported instance of the Azure SQL Database – the Standard 3 (S3) that should support all features and allow the usage of the Columnstore Indexes for the query processing. Without query processing the only advantage from Columnstore Indexes will be the storage compression (2-3 times better than the best RowStore available one), which can still help you to get better performance out of the Azure SQL Database on the lower tiers – IO throttling is the common limit on the PAAS offerings where you pay a couple of bucks (euros) for an incredibly offer that includes disaster recovery by default, security, etc. This has worked perfectly without any typical error messages that someone using Standard Tiers of the Azure SQL Database is used to. :) This alone will be a huge deal breaker for any development of the Data Warehouses/Business Intelligence/Reporting solutions on Azure SQL Database. You can see that everything is fine and that all 10 Row Groups are perfect (ha, with just 1 integer column I would be shocked to find otherwise) and that there are conspiracy theories and that no pressure has been applied to throttle down the performance or internal structures. On the pictures on the left you can see the result of the aggregation and the amount of time it took S3 instance of the Azure SQL Database to process the query – some incredible 113 milliseconds. Not a bad result for 10 million rows and a non-premium database instance. The above execution plan is quite … unhandsome, but that’s a start point to understand & verify what is going with the execution of our query. We have a Columnstore Index scan that runs in the Batch Execution Mode, but you won’t be able to see a lot of the usual details right now in the SQL Operations Studio and so I strongly recommend on the real engagements to keep on using SQL Server Management Studio (given that you will find a stable build for your purpose). 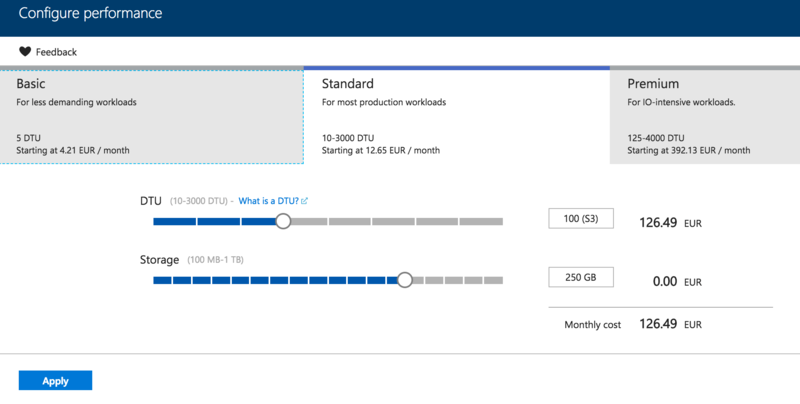 Given that you won’t have a whole private CPU core on the Standard tier, do not expect a parallel execution and hence the amount of memory should not be a huge problem unless you are working with a very wide table – and in such case you will need to consider upgrade paths to Premium instances of Azure SQL Database. No changes in the underlying structure (and it would be a total disaster if this would take place, because the process of migration from one instance level to another could take large minutes). The statement failed because a nonclustered index cannot be created on a table that has a clustered columnstore index. Consider replacing the clustered columnstore index with a nonclustered columnstore index. so here is a small performance tip – upgrade your database to a premium instance, execute that maintenance (changing Columnstore to the RowStore) and only then downgrade to the S2 or lower instance. Overall it will be much faster and not really more expensive. What about addition of some new 10 million rows to the S2 instance, will it also fail ? Everything looks fine, right ? the operation is still blazing fast. What about the internal storage, are we still using the Delta-Stores, or is there a compressed Row Group already? Table ‘dbo.SampleDataTable’ uses a clustered columnstore index. Columnstore indexes are not supported in this service tier of the database. See Books Online for more details on feature support in different service tiers of Windows Azure SQL Database. Oops … This is very upsetting. We can not delete any data from our table but we are able to insert into it? This looks like a serious technical limitation that will be upsetting unsuspecting users who will face it. I am definitely interested in seeing removed in the future. Theoretically marking rows as inactive in the Deleted Bitmap should be a non-memory demanding operation. Yes, because of the Read Committed Snapshot isolation level and potential parallelism it is far from being trivial, but this limitation should be fixed in the future. What actually happens when we get a full Delta-Store and it will become closed? Will Tuple Mover compress it to the compressed Row Group or will we be getting more and more Delta-Stores? Looks quite fine – we have a closed Delta-Store and a new open one! which execution was successful, but it brought no changes to the underlying structure of the Columnstore Index – the closed Delta-Store remained closed and there were no conversion to the compressed Row Group. The error message leaves no doubt – there is no way we can get data from the Delta-Stores (RowStore) compressed into Row Groups unless we load data with the help of the Bulk Load API. Should we even try rebuild the Columnstore Index on S2 instance ? Table 'dbo.SampleDataTable' uses a clustered columnstore index. Columnstore indexes are not supported in this service tier of the database. See Books Online for more details on feature support in different service tiers of Windows Azure SQL Database. I can not be totally happy about the situation, but a good solution (hopefully a temporal one, until the Standard instances won’t get enough memory) for not loosing new data is here and your new data will be loaded into the Columnstore Index. Can we create a new table with a Clustered Columnstore Index on the S2 instance ? Let’s try to create a brand new empty table with the Clustered Columnstore Index in it ? Nope and given what I have observed so far it really makes sense, sometimes I wish that it would simply function and keep data in the open Delta-Store, so the development code would not be broken. The messaging should be corrected and a wrong recommendation should deliver a more clear message, that will leave no doubt that a direct creation of the Nonclustered Columnstore Index currently is impossible. I confess to be quite shocked with the result of the command, because on the premium instances we can add additional indexes without any problems. Yes, it takes a lot of time and significant amount of resources but it works! :( This limitation should be documented, otherwise people might think that this functionality is not implemented on the Azure SQL Database! I imagine this won’t get fixed on the basis that it is a current limitation that with the time shall fade away as more memory will become available for every tier, but I see a good usage for this scenario in the mean time. Downgrading to Basic or Standard: Columnstore indexes are supported only on the Premium pricing tier and on the Standard tier, S3 and above, and not on the Basic tier. When you downgrade your database to an unsupported tier or level, your columnstore index becomes unavailable. The system maintains your columnstore index, but it never leverages the index. If you later upgrade back to a supported tier or level, your columnstore index is immediately ready to be leveraged again. Downgrading to a lower supported tier or level: This downgrade succeeds if the whole database fits within the maximum database size for the target pricing tier, or within the available storage in the elastic pool. There is no specific impact from the columnstore indexes. Understanding memory pressure is very important for the Columnstore Indexes and you have got to keep in mind that every Azure SQL Database performance tier has its own amount of RAM that is not configurable and that this difference between even Standard tiers can have a huge impact on the Row Group sizes. but please do not use those as the references, because Microsoft is constantly improving the amounts & types of hardware and so by the time you are reading this paragraph a very different values might be in usage. To my understanding the biggest different between the current available memory of the S3 and P1 is that it is shared on the Standard tier while it is totally private on the Premium. Upgrading to P2 will allow you to achieve 11.8GB of the Target Server Memory and it will grow accordingly to the further scale-up. You might even consider rebuilding your indexes on the higher instance tier when suffering from Memory Pressure. I know that a lot of effort, time and sweat was put into making Columnstore Indexes available on the Standard instances – and I am without hesitation extremely happy that it is finally took place. I am looking to even more Columnstore Indexes usage, but I definitely would love to see some clean up in the error messages, not directed to the wrong unsupported type of the Nonclustered Columnstore Indexes on Standard 2 (S2) tier. Given that S4, S6, S7, S9 & S12 instances are already in preview – there will be much more space for the Columnstore Indexes usage in the nearest future and I am happy to see that the democratisation of the Data Platform is taking Microsoft to the leading positions in the battle of the PAAS offers. Your S3 instance suddenly became attractive for much bigger databases and it is absolutely worth celebrating! The performance will still be throttled through the available CPU cores and memory as well (there will be less memory than for the Standard & Premium obviously), but smaller firms will be able to benefit from the Columnstore Indexes for their Data Warehouses – but until then you will need to upgrade to at least S3.